Hyatt Centric invited us to sample nearly every dish from their winter lunch menu. Here's what happened! It was a typical Wednesday at the Rosslyn BID. Little did we know, it was about to be anything but typical for the Communications team. The day started with meetings, with some of us rushing around outside the office on a cold and blustery day. At 1 p.m., we converged on Hyatt Centric for a tasting of some dishes from their winter lunch menu, which is available at cityhouse restaurant. "I'll just ask the chef to prepare a few appetizers and desserts for you guys," T.J. Daniels, assistant director of food and beverage, told us beforehand. Not sure what to expect, some of us had still packed lunches the night before. Others snacked a bit before heading over. Tasting a few appetizers and desserts, we reasoned, would not amount to a full lunch—especially when shared among our group of four. As we sat down at a table in cityhouse's private dining room, our friendly and helpful servers Emee and Lifen began to bring out food. Then, more food. Then, more. The long rectangular table where we sat was soon crowded with dishes of beautifully prepared gourmet fare. Eventually, our meal required a second table to hold it all. "I knew I shouldn't have eaten that banana before we came!" said Communications Director Maureen. Crab dip. Salmon BLT. Butternut squash ravioli. Flatbread pizza. Lamb lollipops. Fried calamari. They were bringing us nearly everything on the menu. We felt like royalty, and we were giddy at the prospect of trying it all. Where to begin? Chef George Fassiadis came out to greet us and tell us about the new menu. "We've developed a menu that features classic dishes with a modern twist," he said. "We always try to incorporate local ingredients. For instance, our crab dishes include jumbo lump crabmeat from Maryland. Our apple strudel uses local Pennsylvania Honeycrisp apples. 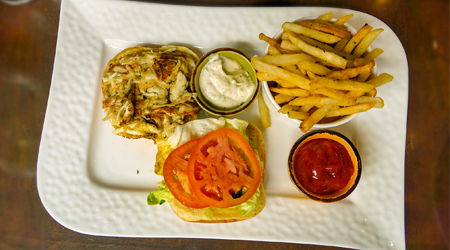 The crabcakes are my favorite item on the menu because I grew up in Annapolis and have always enjoyed them." Our impressions of the food are biased, of course, because Hyatt Centric's kindness and generosity toward us were unexpected, and took place on an ordinary, busy work day. But, biased or not, this food was truly wonderful. We think you'd enjoy it, too, particularly for a special occasion. Lamb Lollipops. 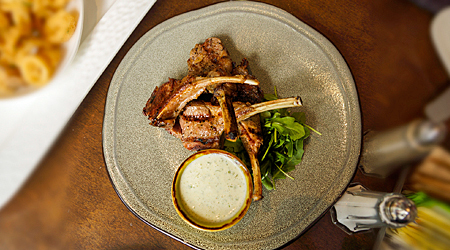 The lamb lollipops are prepared in a rosemary marinade. They were tender, cooked just right, and served with a creamy Greek yogurt dill sauce. We liked that they were easy to eat. No utensils required! Buttermilk Fried Calamari. The buttermilk fried calamari were light and crispy, and not at all greasy. They were served with a flavorful lemon-garlic aioli. They paired perfectly with champagne, which was also part of our dining experience (you can enjoy them with a glass of 2006 Dom Perignon, which cityhouse serves by the glass for $25). 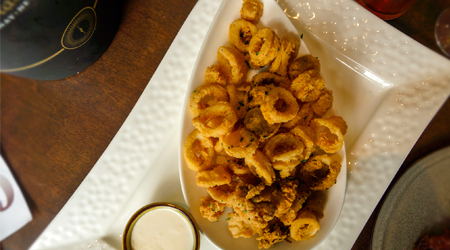 Chef George told us the calamari is one of the most popular dishes on the menu. 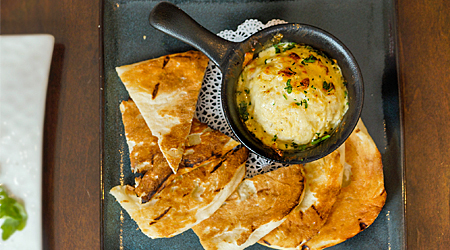 TEAM FAVORITE Warm Crab Dip. Made with Maryland crab, cheddar and cream cheese, this dip had a rich and creamy texture that we found inordinately appealing. It was served with grilled naan. Maureen wanted to eat all of it herself but we persuaded her to save room for the other dishes! 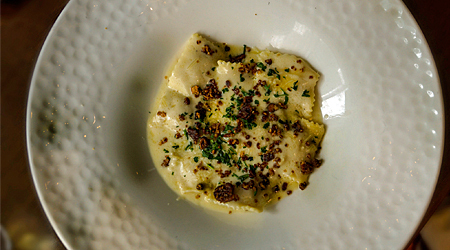 TEAM FAVORITE Butternut Squash Ravioli. This is a starter on the dinner menu, but we sampled it anyway. We all loved it. The squash filling is smooth and sweet, and the nutty Parmigiana Reggiano topping adds just the right flavor. The real star, though, is the cream sauce, which includes brown butter and sage. 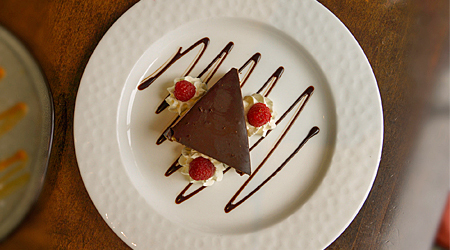 It's rich, decadent and oh so good. We could each have easily polished off our own bowl. This was Graphic Designer Paul's favorite. 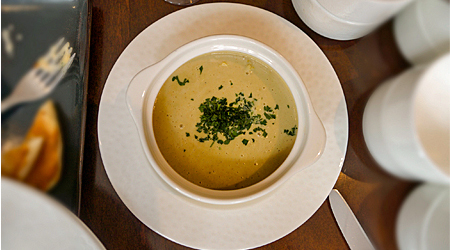 Cream of Crab Soup. Made with Maryland jumbo lump crabmeat, this soup was a satisfying, traditional choice that we really enjoyed. It's also gluten-free, which is a plus for those maintaining a gluten-free diet. TEAM FAVORITE Matzo Ball Soup. This was Communications Director Maureen's favorite dish. The soup was warm and comforting. The matzo balls were surprisingly light and the broth had an unusual, almost sweet flavor that we all liked. 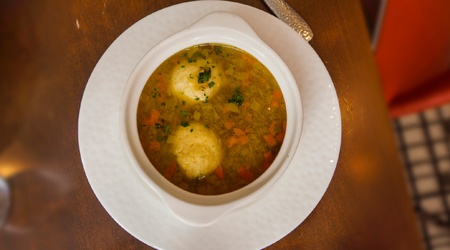 Chef George told us the matzo balls and chicken stock used in this dish are made fresh in house. We didn't expect much from this humble-looking soup, so we considered it the sleeper hit of the meal! 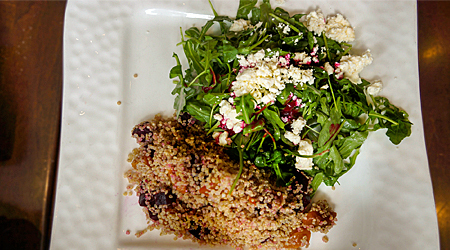 Quinoa, Beet and Arugula Salad. Topped with feta cheese and shallot vin rouge, this healthful and delicious salad features a mix of greens and beets. We loved the earthy, whole-grain quinoa, too. Cityhouse Salad. 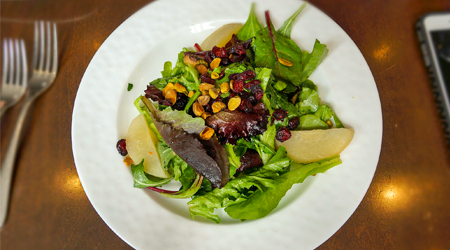 Another fresh and flavorful salad on the menu, the Cityhouse Salad includes mixed greens, pistachios, shallots, poached Asian pears, red wine-plumped cranberries and apple cider vinaigrette. It tasted as good as it looks! 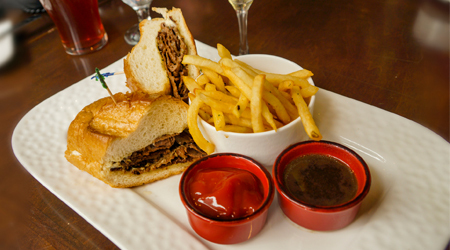 TEAM FAVORITE Boursin French Dip. Made with shaved Angus ribeye and served au jus, this sandwich was satisfying and full of flavor. The creamy Boursin spread added a nice counterpoint to the succulent beef. Social Media Specialist Justin liked it a lot. Crabcake Sandwich. This sandwich was wonderful: full of delicious lump crabmeat and little filler. It tasted fresh, and was served atop a potato roll. If you want, you can order it served over salad instead. 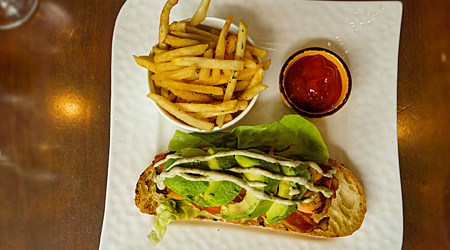 TEAM FAVORITE Open Face Salmon BLT. Another winner, especially if you love salmon as much as we do! The salmon was grilled and nicely charred, and was topped with fresh avocado, a dill and avocado cream sauce, and applewood-smoked bacon. It's served on artisan bread with lettuce and tomato. Maureen liked it so much that she ordered it again when she had a lunch meeting at cityhouse a few weeks later. TEAM FAVORITE Blue Italian Pizza. 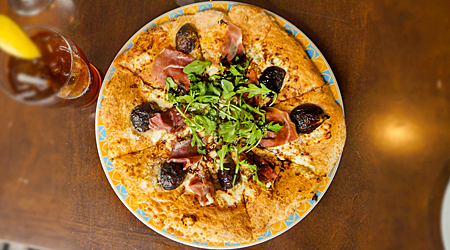 This unusual pizza features red sauce, prosciutto, gorgonzola and figs. It was outstanding! There were so many contrasting flavors that all came together beautifully: salty prosciutto, sweet figs, creamy and pungent gorgonzola, tangy red sauce. This was Social Media Specialist Justin's favorite. 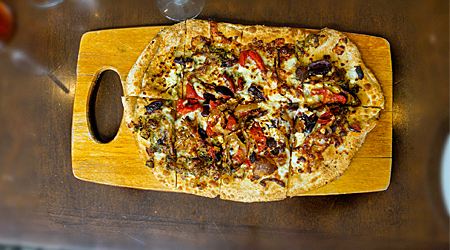 TEAM FAVORITE Veggie Flatbread. Writer Mary loved this dish the most. It features pesto, grilled peppers, caramelized onions, Kalamata olives and feta cheese. The grilled peppers had a delicious charred flavor that worked well with the sweet and rich caramelized onions. And, of course, the feta and olives added some nice saltiness. The flatbread was light and crispy, making this feel less heavy than a pizza. Apple Strudel. 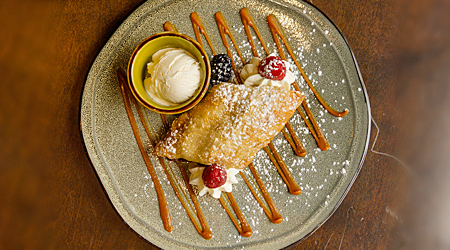 The apple strudel is served with vanilla ice cream on the side, and comes drizzled with a warm caramel sauce and sprinkled with powdered sugar. As mentioned previously, it's made with local Pennsylvania Honeycrisp apples. What's not to like? Peanut Butter Crunch Cake. We love chocolate and peanut butter, so this rich and decadent cake was just what we needed. It's perfect when you feel like indulging and need something sweet and satisfying. 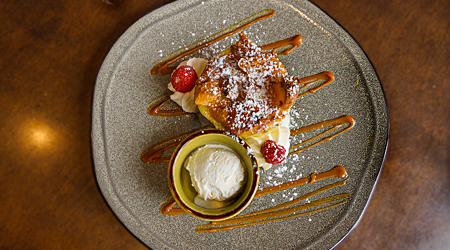 TEAM FAVORITE Warm Bread Pudding. Graphic Designer Paul loved this. He's not typically a bread pudding fan, but he liked the texture and flavor of this dessert, which he thought was more like a cake than a bread pudding. It's made with croissants and vanilla cream custard, and we all loved it! Enjoy the cityhouse winter menu now through the end of March 2018. If you try it, let us know what dishes are your favorites! Email rosslynbid@rosslynva.org or connect with us on Facebook, Twitter or Instagram.